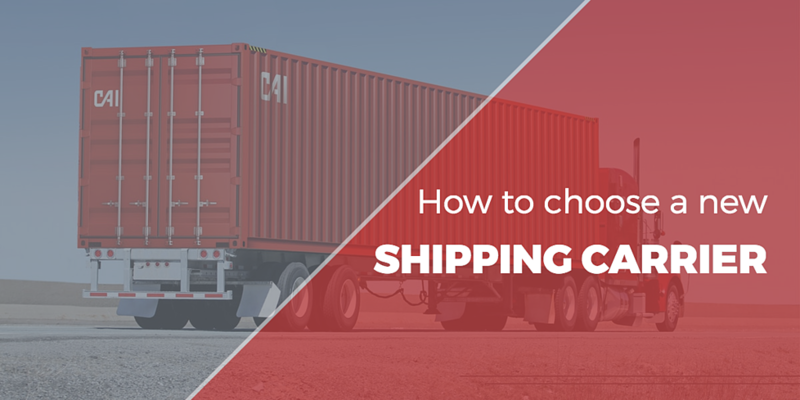 When you’re evaluating new shipping carriers to work with, the stakes are pretty high. These are people you’ll potentially entrust with your valuable goods. Their efficiency and care can mean the difference between increased profitability and significant loss for your company. In addition to the financial implications, your company’s reputation should also be a key consideration. No matter how well you handle your own internal processes, if products don’t arrive on time and in good condition, it reflects poorly on your company. Crucial business relationships can be damaged by careless freight carriers. Clearly, this is not a decision you should take lightly. With so much on the line, it’s important that you have a clear idea of what you’re looking for. When you start your search, decide whether you want to optimize just for price, or for a high level of service. Obviously, when searching for a carrier, concrete factors like price and capacity need to stay on your radar. However, optimizing solely based on price is likely not a wise choice. The lowest-priced carriers may cut corners or have a more lax approach to timelines than you or the receiving party, leaving you with more hassle than you’d like. It’s important that the carrier’s level of professionalism, trustworthiness, and reputation be part of your decision-making process. The Federal Motor Carriers Safety Administration (FMCSA) has some basic insurance requirements that interstate motor carriers must meet in order to operate. These requirements include covering public liability, personal injury, and damage incurred to others’ property in the event of an accident. The basic requirement for general operations is primary liability coverage of $750,000, with higher minimums for anyone transporting hazardous materials. However, these numbers are the result of legislation that dates back to 1985. In 2014, the FMCSA released a report acknowledging that current insurance limit requirements are not adequate for catastrophic crashes. While $750,000 of coverage is still the only technical requirement for carriers, many shippers prefer to see insurance covering $1,000,000 at the minimum. It’s important to note that FMCSA-required insurance is liability insurance only; it doesn’t cover the value of the cargo in the case of loss, damage, or theft. Many carriers opt to exceed what is required by law and purchase cargo insurance that would at least partially cover the cost of goods lost to unforeseen circumstances. In these cases, the price passed onto the shipper will naturally be higher to account for the additional expense incurred by the carrier. This is another reason not to default to the lowest-cost carrier; the additional cost of an adequately-insured carrier is often worth the peace of mind. Before choosing to work with a carrier, it’s wise to do a little research about their compliance and safety records. In conversations with company leaders, make sure you ask them whether there have been any significant accidents in their fleet in the past several years, and, if so, how they handled the situation. The FMCSA also maintains the Safety And Fitness Electronic Records (SAFER) system, where you can access publicly-available data about a carrier’s safety and compliance records. All you need is their Motor Carrier (MC) number, U.S. Department of Transportation (USDOT) number, or business name to search. The company snapshot, which is a free service that provides a record of the carrier’s size, cargo, inspection and out-of-service summary, along with crash data and safety ratings, if applicable. It may be wise to take advantage of this valuable information to help make final decisions about working with a specific carrier. While you can likely feel out whether a carrier meets your required level of professionalism and safety by using these two telling factors, this kind of due diligence may take more time than you’d prefer. Searching for new carriers is another great example of a time when leaning on your third-party logistics partner’s knowledge and expertise can save you time and stress. Instead of taking time to individually research and interview potential carriers, trying to coordinate on price, capacity, and location, you can reach out to your 3PL and let them handle the rest. They will have done the legwork of establishing and maintaining a strong, trustworthy network. Since they’re in regular communication with their trusted carriers, they’ll be able to find the necessary capacity at a fair price, without compromising on professionalism, communication, and commitment to safety. The net result: your goods and your company’s reputation are protected, without the stress or second-guessing involved in sourcing your own carriers.